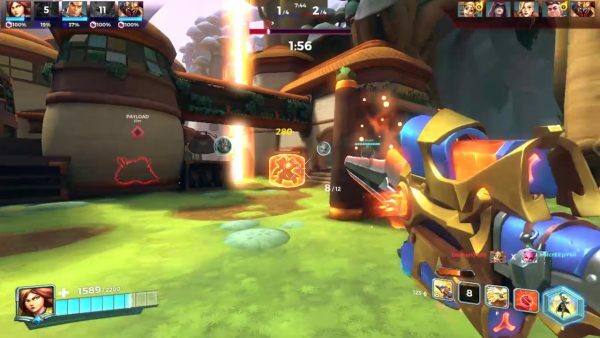 At first blush Hi-Rez Studios Paladins is easily compared to Blizzard’s Overwatch – both games are bright and colorful, both games feature a large roster of heroes with different play styles and both games are all about co-operative teamplay. In the two years since launch Hi-Rez has worked hard to distance their game from Blizzard’s offerings so much so that they’ve revamped player progression twice and even cancelled entire game modes – Siege and Survival (that latter being spun off as Realm Royale). Hi-Rez’s PR department sent me a Founders Pack code for Paladins on Nintendo Switch ahead of today’s free-to-play. With the recent Rise of Furia event ending on PC and PS4 with the release of the latest patch – which should be out on Nintendo Switch sometime soon – I thought it would be a perfect time to share my thoughts on the game. As a team based first person shooter Paladins has quite a bit of competition, mainly from Splatoon, which also has a bright and distinct art style of its own. Paladins feels great to play with the joycons both in docked mode and handheld (which I used primarily while playing for this piece). Draw distance, team markers and character effects are all readable and get your attention even on the smaller screen. Once you get used to the game’s UI everything just works when playing in handheld, which is excellent. Similar to Overwatch, Paladins doesn’t bog you down with death percentages or KDAs, instead even assisting with a kill will count as an elimination – something that I wish more competitive FPS games would adopt. Paladins in Switch might not run at the same 60 FPS as its PC counterpart but this is really not a huge drawback, given how well it seems to hold at 30FPS in handheld mode and can be played anywhere. Paladin’s Founder’s Pack instantly granted me access to all of the available champions with the promise of automatically receiving any future additions for free. When comparable MOBAs can single characters for upwards of $15 USD the $29.99 Founders Pack seems like a no-brainer, when it comes to Free to Play Title. 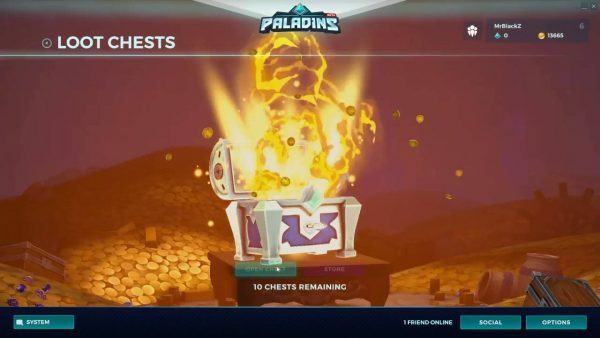 What’s not advertised however is that the majority of the “progression” in Paladins is unavailable even with all of the unlockables provided within the Founders Pack. By completing games in either of the available modes you’ll earn gold which can be used to level up an individual champion. Along the way, throughout the 50 individual character levels your chosen champion will be granted a spare amount of emotes, alternate voice lines and there’s a final “golden skin” available for those who make the ascent to level 50. The remaining various unlocks for all of Paladin’s champions are hidden behind RNG loot boxes which can only be earned through a premium currency. It is true that this currency can be earned in small amounts by completing 7 days of login rewards but it would take you almost a month to earn enough for a single chest, and even then you’ll have no control over what cosmetics are unlocked. Furia wields a semi automatic mid range rifle with a bayonet attached. She is a ranged healer who can use one of the abilities automatically bound to the left shoulder buttons to apply a massive 1000 HP heal to a single target. Pyre Blade summons a slow moving vertical beam of light that deals a massive amount of damage over time to opponents who are within its range. 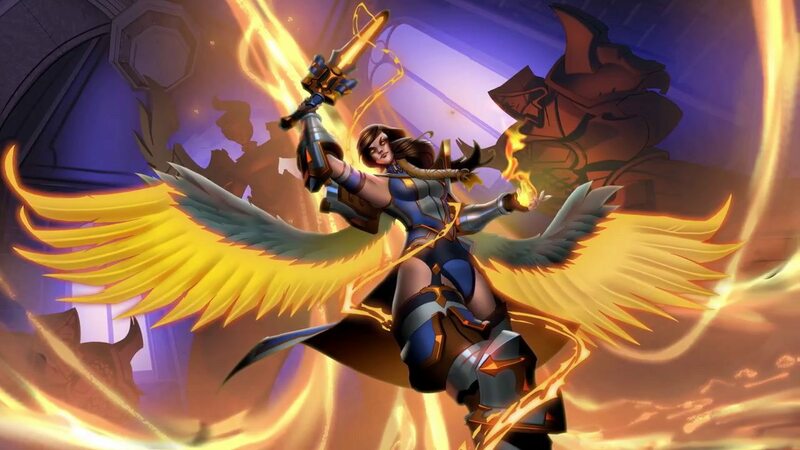 Her utlimate – Inflame – acts as a sort of team boost, making Furia un-targetable for 2 seconds while giving teammates increased damage and movement speed. In the right hands Furia can be a valuable clutch healer and kill streak powerhouse, during my time playing her I think I racked up multiple 20+ streaks. Paladins: Champions of the Realm is now free to play on Nintendo Switch. You can go grab the game’s client and try it out for free from the Nintendo e-Shop as of today. Hi-Rez PR provided an advance copy of the Founder’s Pack prior to the public release for our consideration meaning that I had all of the game’s characters unlocked from the start. The free to play version provides a rotation of ever-changing free characters as well as the ability to complete daily challenges to unlock gold to purchase individual characters.